This Clinical Practice Guideline (CPG) is based on the review of clinical literature and consensus of current clinical practice. By far the most common cause of heel pain is mechanical overuse. Other causes include arthritic, neurological, traumatic or infectious, or other systemic causes, such as autoimmune conditions. But if your patient is complaining of heel pain, think mechanical overuse first. The two types of mechanical heel pain are Plantar heel pain (P1) and Posterior heel pain (P2). Plantar heel pain is the culprit in most mechanical heel pain cases. Plantar heel pain is defined as pain under the heel at the insertion of the plantar fasciia (with or without a heel spur). If the pain is under the heel, this is what it is. What causes Plantar heel pain? Plantar heel pain is caused by biomechanical abnormalities that apply pathological tissue stress to the plantar soft tissues. Or to put it more simply, if the foot is not working right, it makes the plantar fascia work a lot harder. This can be complicated by nerve entrapment (medial calcaneal and medial branch of the lateral plantar nerve) in some cases. How does it present in patients? Plantar heel pain has a fairly predictable patient description- severe pain localised to the plantar heel, particularly when first weightbearing after a period of non-weightbearing (i.e. getting out of bed in the morning, after driving 30 minutes in the car etc). This pain will typically decrease after a number of minutes, and then returns gradually through the day, and worsens with more time spent on feet, or with higher intensity activities (e.g. running, exercise, jumping etc). When is the pain worst through the day? What is it like first thing in the morning? Does the pain reduce after a few minutes of walking around in the morning, or after rest? What have you tried to help with this, and has it been successful? If the above answers are indicative of typical plantar fasciitis, then the physical examination is useful to confirm the diagnosis. Using your thumb, palpate the course of the plantar fasciia, starting at the hallux, and moving posteriorly down to the medial calcaneal tubercle. Take note of any nodules or areas of exquisite pain along the plantar fasciia, as these are also confirming signs of excessive tension stress in the plantar fasciia, from pathological biomechanical overuse. 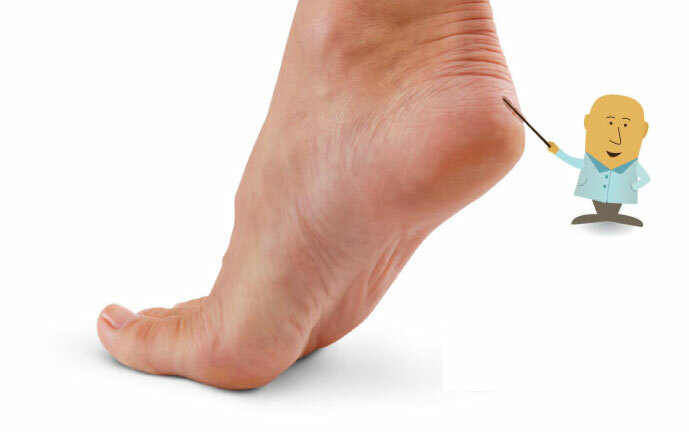 Sometimes is can be difficult to reproduce pain directly plantar to the heel, as many patients have significant adipose layer, and you will not be able to apply the same force with your thumb as their body weight applies with each step. However, any palpable pain in the plantar fasciia, along with a history suggestive of plantar heel pain, is a pretty sure thing. Once confident of your diagnosis, imaging is not generally necessary to begin treatment. If you do have reason to seek imaging, plain radiographs (x-rays- Lateral View) will sometimes show a plantar heel spur, however this is not clinically significant, as the heel spur is very rarely the cause of symptoms. As symptoms of plantar heel pain are due to tissue stress in the plantar soft tissues, the most helpful imaging to confirm diagnosis is a diagnostic MSK ultrasound study. This will usually show thickening of the plantar fasciia. MRI will also show plantar fasciial pathology, and also is useful for ruling out other differential diagnoses, if you are worried about that. Plain Radiograph- Observable Heel spur, not clinically corellated with plantar heel pain symptoms. Diagnostic Ultrasound- Useful to confirm thickening of the plantar fascia in plantar fasciitis. Firstly, the longer your patient has had symptoms, the longer it will take to heal. Make sure they understand this! Remember, this is a mechanically based injury, and it needs a mechanically based treatment approach. NSAIDs and cortico-steriod injections may mask the presenting symptoms, but they will have no effect on the causative biomechanics, and are shown to have no long term effect at 3 months or longer. Initial treatment should involve strapping protocols (low dye technique) and full assessment of all footwear for all weightbearing activities. This will require an audit of all weightbearing activities, including work, leisure, sports and exercise, activities of daily living, and which shoes are used at each time, including any recent or corresponding major changes (such as new work boots or running shoes, or a long holiday to the beach wearing sandals or thongs). Identifying problematic footwear and changing habits is a very effective treatment option for many people. Other initial treatments should include stretching exercises (for the plantar fascia and poster calf muscle complex) and icing the affected heel. This second phase of treatment will result in effective resolution of symptoms in up to 90% of patients with 2 to 3 months. For the remainder, treatment should persist until symptoms resolve. If improvement has plateaued, then systemic causes of disease should be considered. If phase 1 and 2 fail to give adequate resolution of symptoms, then surgical options may be considered, such as plantar fasciotomy. This will require referral to an orthopaedic surgeon or podiatric surgeon. The posterior heel pain is the second most common type of mechanically caused heel pain. Posterior heel pain comes in two main types. The first is Insertional Achilles tendonitis, and the second is bursitis (often with associated Haglunds deformity). Insertional Achilles tendonitis (IAT) usually starts with a slow, gradual onset, leading eventually to chronic posterior heel pain and swelling. Pain is aggravated by increased activity, such as walking and running, and by pressure caused by shoes. There is usually a visible and palpable swelling of the tendon just proximal to the insertion of the Achilles tendon. Xrays will often show posterior heel spurs. Again- this is a mechanically caused condition. Consider the mechanical causes, and aim your treatments accordingly. This will need to include heel lifts and/ or orthotics, padding to reduce pressure on the posterior heel in footwear, and physical therapies (including a careful and gradual stretching regime). These initial steps are probably best managed by a podiatrist and/ or a physiotherapist, who has access to facilities to make the necessary footwear modifications and orthotics. NSAIDs are a useful addition initially to reduce inflammation and pain. After 2 to 4 weeks of standard care, if symptoms still persist, a referral should be made to a podiatrist for assessment of biomechanical function, and orthotic/ footwear modifications as appropriate. Immobilisation using a cam walker/ moon boot can be necessary in particularly acute cases. It must be stressed that local corticosteroid injections are not recommended, due to the high risk of tendon rupture, and generally poor long term outcome at 3 months otherwise. A surgical referral should be considered after 3 months of poor conservative care. Procedures to be considered may include resecting the posterior spur, plus removal of injuried tissues such as tendon or bursae.